This baton has a coloured handle approx 5" long, slim enough for smaller hands with a simple push button switch. Available in Metallic Blue; Matt Blue; Metallic Red; Metallic Silver. Colours will be selected at random unless specified. 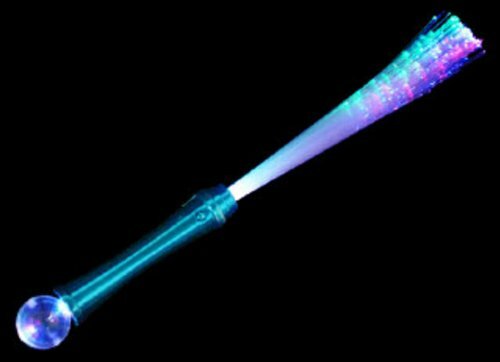 It has a clear plastic moulded ball of approx 1" on one end which acts as a lens to create an amazing patterned light show over a full room. It also has fibre optic strands at the other end ranging in length from 2" to 8" to give a glistening effect throughout the whole length. Each requires 3 button cell batteries (supplied and replaceable). 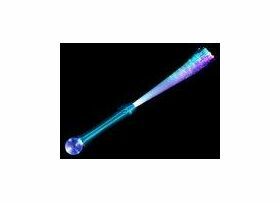 Just turn out the lights and move this Galaxy Ball baton around for an amazing show.